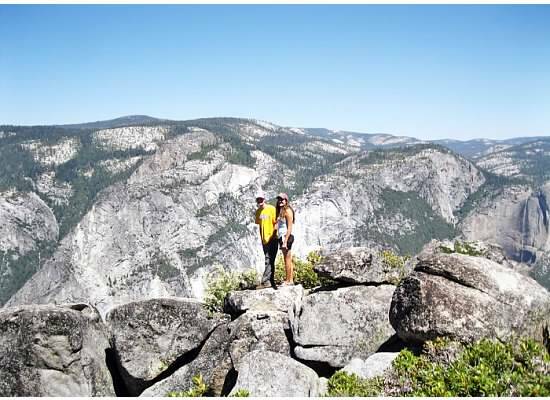 Andrew and his girlfriend, Sarah were heading to Yosemite National Park. Before they left home he asked me to join them. I jumped out of bed with a happy heart, dressed, packed a lunch and was ready to go in a flash. 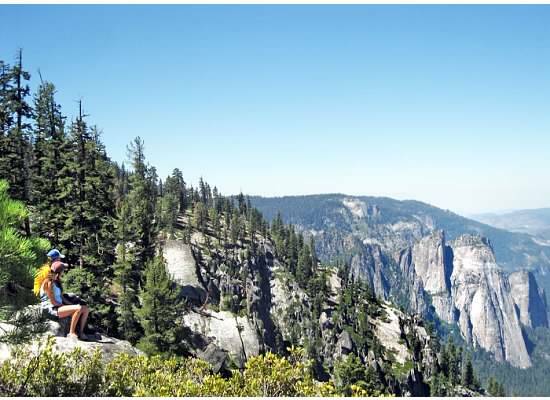 We zoomed passed the trailhead for Taft Point and the Fissures–our destination, and headed up to Glacier Point at the end of the road, elevation 7,200 feet. Andrew and Sarah at Glacier Point with Half Dome in the background. Sarah did not remember ever visiting Glacier Point, so we walked around the area admiring the extraordinary views. 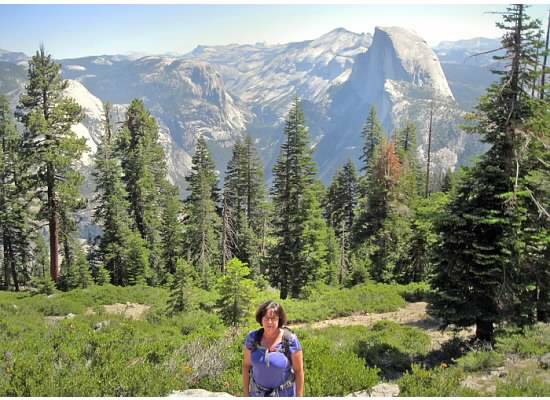 We saw the falls: Yosemite, Vernal and Nevada–the fullest; and Half Dome, the most recognizable rock formation in Yosemite. I pointed out Mt. Hoffman where years ago Mary Elizabeth and I climbed. 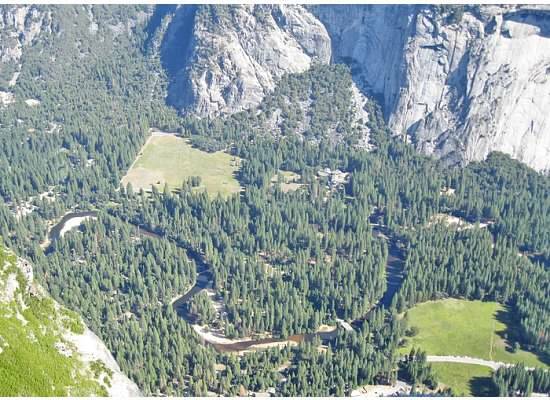 We looked down 3,200 feet at the valley below and the winding Merced River. The Merced River flows from the Sierra Nevada and is 145 miles long. From Glacier Point we left the arresting views behind for a time and took the Pohono Trail through a shady forest. The 400-foot climb began immediately. Looking up while taking a break. A group of teenagers worked diligently at maintaining the trail. We passed them huffing and puffing from the elevation change–or was it just me who was out of breath? Coming out of the woods the view opened up of Half Dome and Clouds Rest. We stopped along the trail many times to appreciate the extreme views. Andrew and Sarah looking towards Cathedral Rocks in the distance. A Yosemite Conservancy guide leading a family of four told us that we had stopped at Roosevelt Point which was recently named. I’ll have to take his word for it since I couldn’t find it on a map or in the Yosemite Place Names book. Andrew facing El Capitan, at Roosevelt Point. I had hoped to overhear the guide as he told the family about the area, but didn’t want to eavesdrop; so I wandered away and watched Andrew and Sarah play on the rocks. 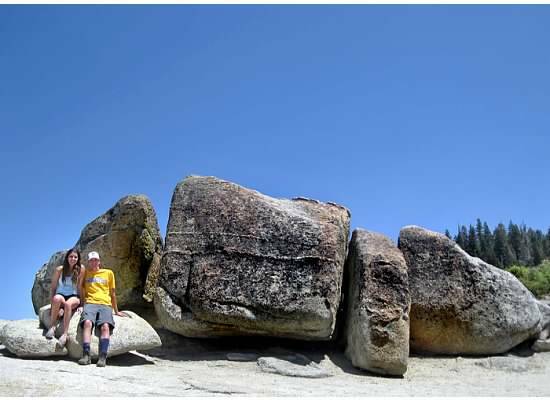 Surrounded by a sea of granite. Besides the amazing views, we also caught a glimpse–too quick for my camera–of a western tanager with its orange head, yellow body and black wings. We left Roosevelt Point and continued towards Taft Point. Corn lilies were in bloom in a damp area near Sentinel Creek. I haven’t seen a blooming plant in at least two years. From what I’ve learned about them, conditions need to be just right before they’ll bloom. 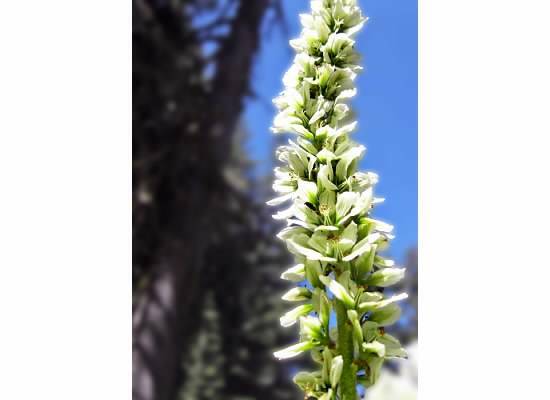 A corn lily in bloom. 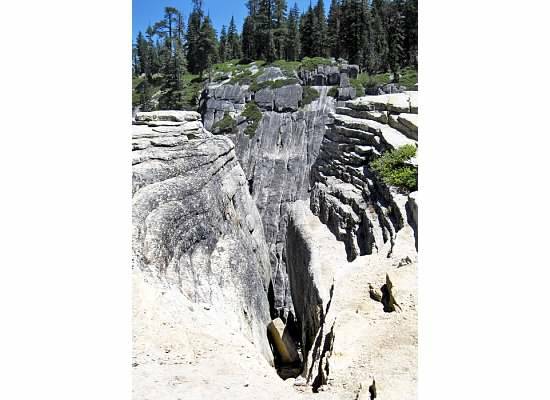 Then we came to, or almost stumbled into, a fissure–a deep crack in the granite. There are five of them in the area that drop hundreds of feet or more. Their edges are sandy and the openings are not easily seen from a distance. Andrew and Sarah (in the background) close to the fissure, where two large boulders are stuck between the crack. 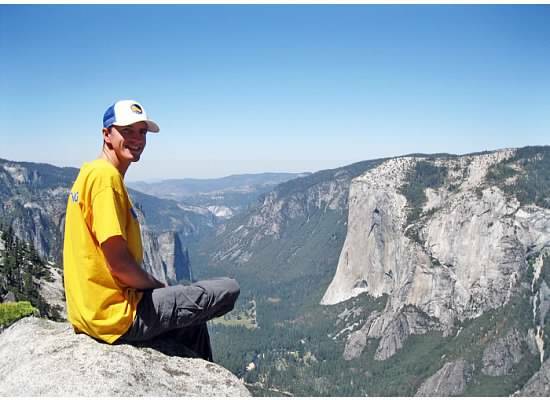 We walked up to the railed lookout on a protruding rock then over to Taft Point proper viewing El Capitan, Three Brothers and much more. Happy to have been invited on the hike with Andrew and Sarah. El Capitan on the right. Andrew and Sarah perched precariously close to the edge, or so it seemed. Too nervous to watch, I found a safe spot and ate lunch. My view during lunch. You can’t see Sarah who sat below Andrew on the edge. When it was time to leave, they scrambled up from the ledge and sat on sound boulders while my heart calmed down. Large rocks at Taft Point. Our plan was to go from Taft Point up to Sentinel Dome then back to Glacier Point making a loop hike, but Andrew ran out of water. I didn’t bring the Steripen to purify water, but Sentinel Creek was just a mud puddle anyway even though the area seemed lush. 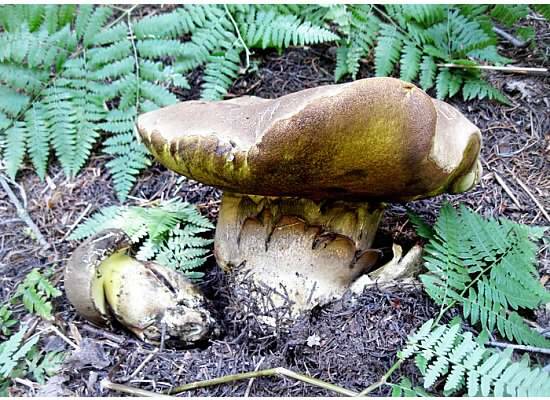 A trampled path through the ferns led to a giant mushroom. 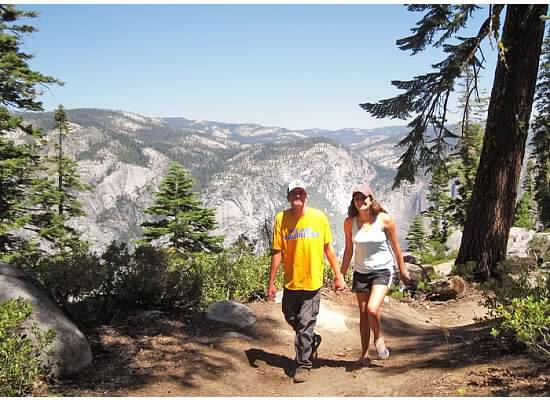 We walked the last mile to the Sentinel Dome trailhead where we caught the shuttle back to Glacier Point, something new that the park has been doing since closing Mariposa Grove for renovations. I was pleased as punch to have been invited on this hike with Andrew and Sarah. I enjoyed watching them interact, talking with Sarah and getting to know her a little better, and showing her the Yosemite that Andrew and I love. 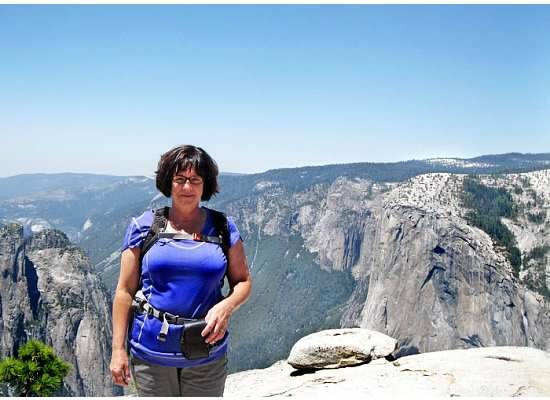 This entry was posted in Yosemite Hikes and tagged Cathedral Rocks, Fissures, Glacier Point, Hiking, Pohono Trail, Roosevelt Point, Taft Point, Yosemite, Yosemite National Park on August 9, 2015 by Janet. Great pictures and narrative. I got butterflies in my stomach seeing Andrew sitting so close to the edge. How nice that he and Sarah invited to to join them. I had to hold my tongue, but actually yelled at Andrew once when he started to go into the fissure. It makes my hands sweat thinking about it. Wonderful! What a great hike. 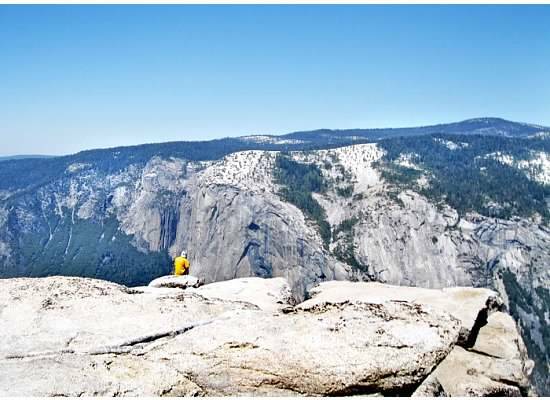 I have seen Glacier Point in the past and loved it, but not in some time. The fissures were new to me–I had not even heard of them. And how special for you to be invited along. Serenditious adventures are always the best! Thanks for letting me tag along. 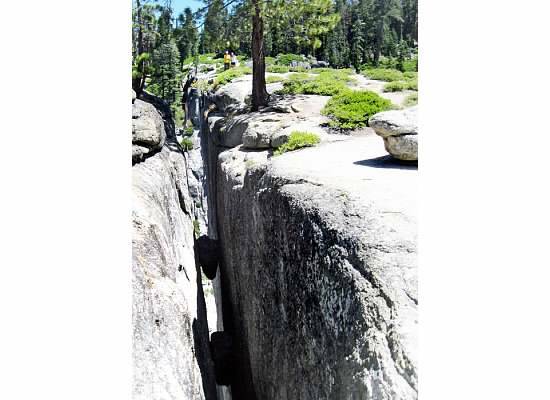 I may drive out to Glacier Point sometime early in the fall. Beautiful Boletus– but I have little idea what species! Thank you for posting such wonderful trail stories, they are good for our hearts. Robin, thank you so much. Yes, the boletus was a hit. Another hiker came right behind me to take a photo. I remember going to these places with you. It took my breath away and made me cry when I saw the view for the first time. I loved being able to join the hike thru your blog! Great pics too. Thank you. That was a fun day when you came with me. I tried to find that comfortable rock where we sat for lunch, but didn’t know exactly where it was. Loved following your day in nature. What an awesome day for you three in the vastness of God’s landscape! Thank you for sharing with us, as your descriptions make us feel as though we were with you! Thank you! It truly IS God’s landscape. It was. Cooler up there too. Stunning views!! It makes me wish to be there. I thought of you when I was there, Carol. What awesome views! 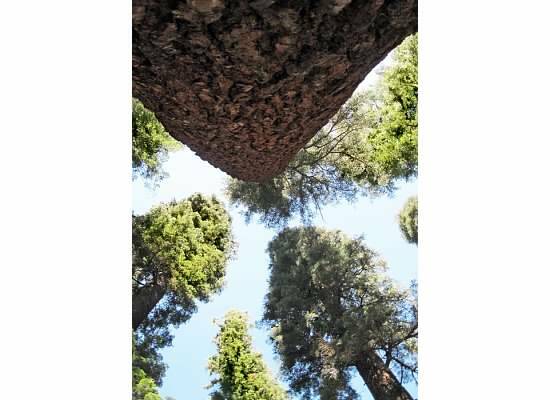 I really need to get out to Yosemite to do some hiking! Thanks for sharing.